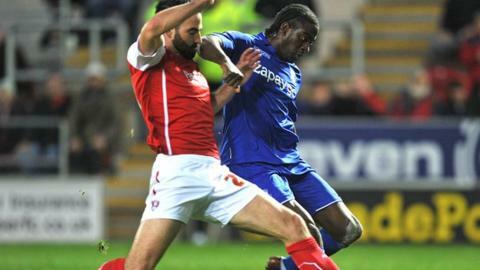 Birmingham City top scorer Clayton Donaldson is confident they will retain their Championship status this season if they continue the form shown in their 1-0 win at Rotherham United. "We know we've got the players and, if we keep playing like we did here, we'll have no problem," he told BBC WM. "From the get-go, you could see we wanted to get the ball down and play." The victory at the New York Stadium stretched Blues' unbeaten run to four matches under new manager Gary Rowett. "Saturday's performance at Rotherham was as convincing an all-round display as Birmingham City fans have seen in three or four years. "New manager Gary Rowett has rebuilt the squad's fragile confidence within four matches of taking the job - this was a Blues team playing without fear, and looking like they were really enjoying their football again. "One beneficiary has been Scottish forward Andy Shinnie, who has started all four games under Rowett and is beginning to flourish. "It was Shinnie who sent top scorer Clayton Donaldson through for the only goal. In all honesty, the margin should have been considerably wider." Most impressively, after losing 8-0 at home to Bournemouth on 25 October, following the sacking of Lee Clark five days earlier, they have only conceded one goal in the four games since Rowett took charge. And after a performance described by Rowett as their "most complete" since he became Blues boss, their haul of eight points from four matches has now hauled City out of the bottom three, up to 19th in the Championship table. "Being in the bottom three is not great, no matter what stage of the season," added Donaldson. "But, from the start our fans were terrific. It was like a home game. They were singing non-stop, like they were against Watford, when they were amazing. "They brought us the win that night and it was the same here. The players were thriving on it."